There’s nothing more exciting than drifting over an underwater hump and seeing the fishfinder light up with returns from big fish. I was a twinkle in my father’s eye in 1959 when Carl Lowrance and his sons revolutionized fishing with their Little Green Box. Things have changed a lot since then. 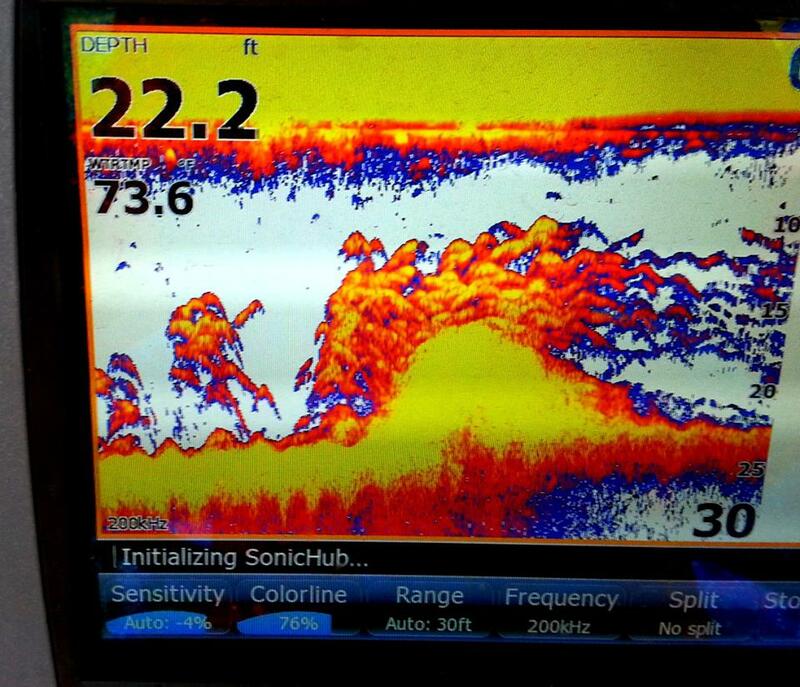 There’s no doubt that a good fishfinder is an essential tool for successful fishing. Just like with all fishing equipment there are many options to consider when it comes to choosing the right electronics for your angling arsenal. 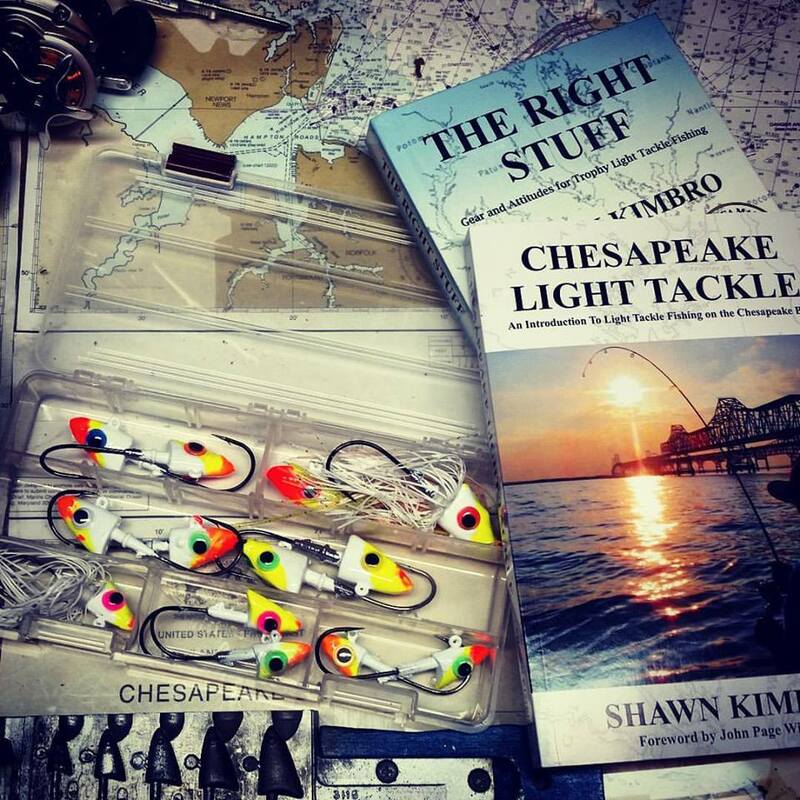 There’s been a lot written about the best units for off-shore fishing, and even more about fresh-water fishfinders, but I haven’t seen too much about the electronics that work best for light tackle fishing in the shallow, brackish waters of the Chesapeake Bay. Nothing beats experience in figuring out the essential bells and whistles of a good sonar unit. You can’t go wrong by hiring a guide and watching the way he or she uses her electronics. Since we’re in the business of shortening learning curves, here are ten tips to help you select the best light-tackle fishfinder for the Chesapeake Bay. 1. 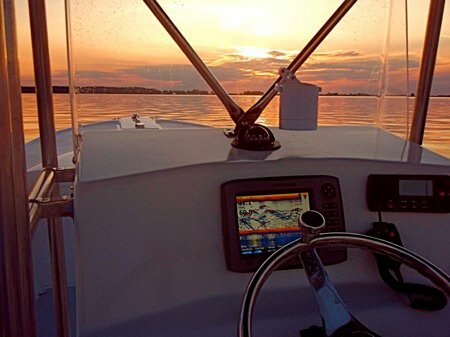 Take it Easy – Maybe you don’t mind reading a 200-page user’s manual prior to pushing the power button on your new sonar unit. Not me. I want to turn that sucker on and go fishing. In my book, any unit that takes more than ten minutes to set up is too complicated. 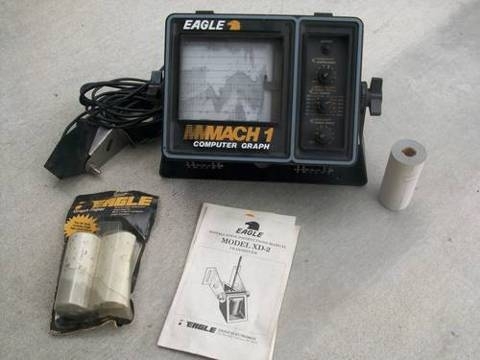 Fortunately, most modern marine electronics come with built-in settings that allow easy use right out of the box. I say most, not all. Before you buy, spend some time in front of a display unit going through the features. Make sure you find a unit that is easy to use with intuitive menu choices. 2. 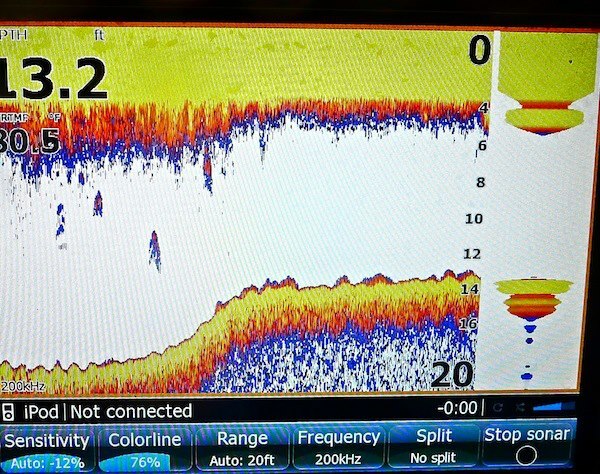 Get What You Pay For – Multi-featured fish finders can be expensive. Some features are essential, some are just nice to have. The more you get, the more you pay, but don’t spend money for something you don’t need. Fishfinders work by sending a sonar (sound) wave from a transducer down through the water. The wave is narrow at the source, then gets wider as it penetrates deeper, forming a cone. Whenever the sound wave encounters something, it bounces back to the base unit where the distance and time is calculated and then drawn on a screen. Softer items absorb more sound, so a fish finder can detect the make-up of the bottom and distinguish the contours of fish or other objects encountered in the cone. The more sensitive and powerful the unit, the better the picture on the screen. 3. Go Big – Get the biggest screen you can afford. On second thought, get the bigger screen you can’t afford. Shelling out the extra bucks might sting at first, but you’ll be thankful you went big when you see that screen in real live conditions on the water. My recommendation is a 7-inch screen at the bare minimum. Go with 10-inch or bigger if you can afford it, especially if you plan to use a split screen for a GPS system. You’ll also want to get a screen with as many pixels per square inch as possible. More pixels means a higher definition picture on the screen. 4. Freq Out – Just as you can hear the low thumps of a bass guitar at Red Eye’s Dock Bar when you’re casting near Love Point, lower frequency sonar waves can travel a very long way beneath the water. On the flip side, higher frequencies provide greater detail. Most fishfinder transducers come with 50, 83, 192, or 200kHz frequencies. Since the Chesapeake Bay is shallow, you don’t need a lot of penetration. Higher frequencies are best. Frequency is directly related to cone angle. That’s just the angle at which the waves spread out in the water. You’ll see more fish with a wider cone angle, but you lose detail as the cone spreads out. A low frequency transducer has a wider cone so you can usually see more area, but do you really need it? In shallow water it really doesn’t matter because modern fish finders have enough built-in power to detect returns on either side of the cone even at high frequencies. In fact, in the slightly-salty waters of the Chesapeake Bay, a 200kHz transducer that is rated with a 20-degree cone angle can show fish out as far as 60 degrees. You can also find transducers with dual, triple, or quad frequencies. That just means you have the option of switching between high and low frequency views. It comes stock with many units, but you really don’t need the low frequencies for the Bay. The latest technology in transducers is called CHIRP (Compressed High Intensity Radar Pulse) which can transmit simultaneously on high and low frequencies. That’s nice to have, especially in the wide open ocean and for maintaining contact with the bottom at high speeds, but I’m not convinced it’s much of an advantage in the Bay. 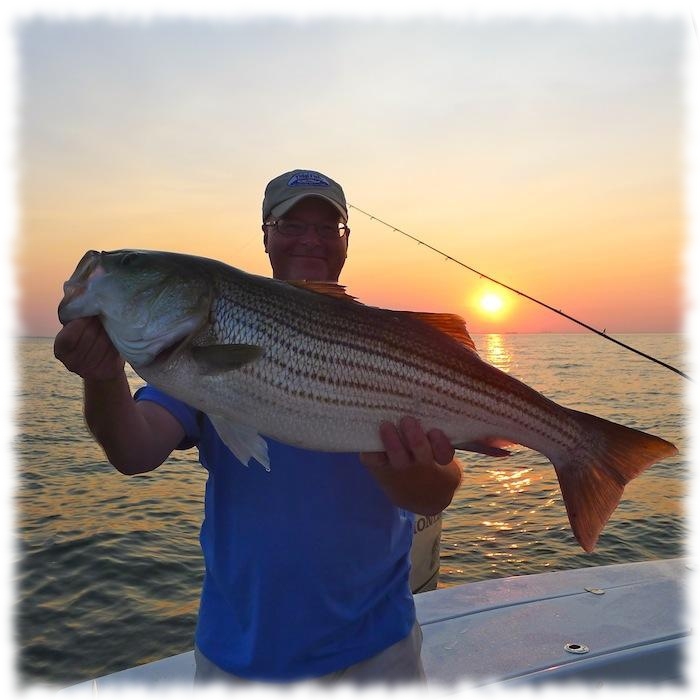 For Chesapeake Bay fishing, go with a stock transducer with the highest frequency. 5. Shoot to Score – Your next choice is between a thru-hull, in-hull, or skimmer (transom mount) transducer. There are advantages and disadvantages to each. Until recently, I always used skimmers, but I’ve seen so many external transducers knocked off by floating logs or crab pot floats in the Chesapeake Bay that I now recommend an in-hull transducer. Nothing is more disappointing than to arrive at an highly-anticipated fishing spot only to find a broken transducer dangling behind the boat. Go with the in-hull transducer. My strategy is to glue a skimmer to the bottom of my bilge. I might lose a little power by shooting the signal through the composite hull, but I don’t notice it in the waters I fish. All the sonar pictures in this entry are taken with a skimmer transducer shooting through the hull. Thru-hull transducers require a hole in the bottom of your boat. They may be slightly more sensitive but they also might leak and sink you boat. My recommendation for the Chesapeake is to shoot through the hull. 6. Track Those Temps – If you fish in the winter or early spring, you probably know that fish seek out areas where the water is warmest. Look for a transducer with a built in temperature sensor on a unit that allows you to keep the temp displayed on your screen. This is especially important if you fish warm water discharges and shallow places like the Susquehanna Flats where one or two degrees can make the difference between success and failure. 7. 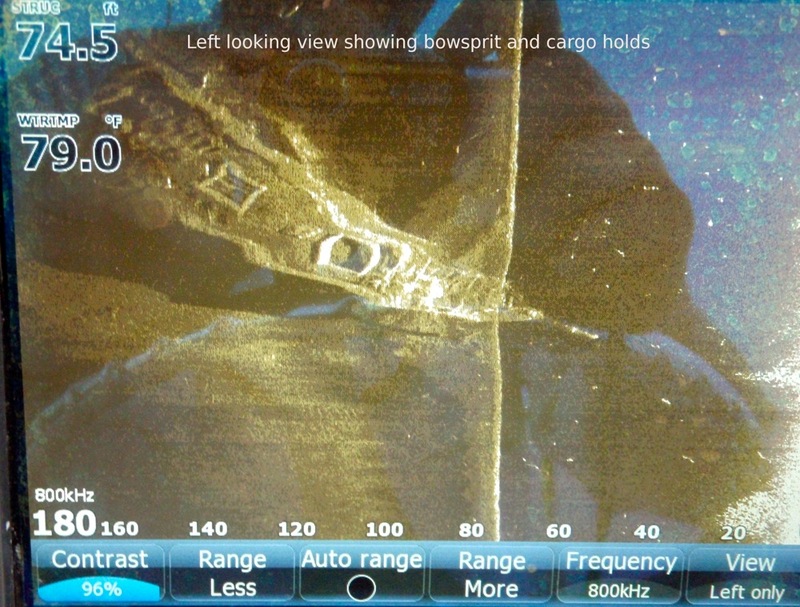 Side with Side Scan – Side imaging sonar has emerged as a leading technology in fishing electronics. When I first got it I used it all the time. Lately, not so much. The advantage of side scan is that it can produce sharp images over a large area. That’s useful for identifying underwater structure and locating rocks, logs, wrecks, or other cover. I don’t think side scan is as good at pinpointing fish as traditional sonar. At least, not yet. I use it more in the rivers and around bridges and docks than I do over humps and ledges in the Bay. Watch for steady incremental improvements in side scan technology such as 360 degree views and multi-frequency integration. 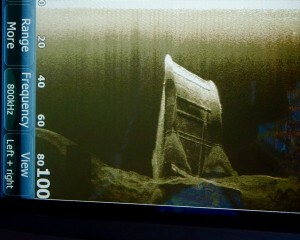 Here’s a side scan shot of a shipwreck near Annapolis and another of a piling on the Bay Bridge. If you want to see more you can follow this link to a previous CLT post about the wreck of the Herbert D. Maxwell. 8. 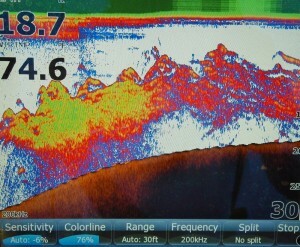 Analyze The Algorithms – You can find most of the above features in any of the better commercial fishfinders. It’s the proprietary data-interpretation algorithms used by individual companies that make choosing a fishfinder challenging. There can be big differences in how signals are interpreted and displayed. For example, some manufacturers build in frequency filters that make fish look more like inverted Vs. Others show fish as a multi-colored mass. Some algorithms even make estimates about fish size and bottom composition and write it out on the screen. Personal preference plays a big role here. As long as you have all the essential features, it just comes down to getting comfortable with the returns you’re seeing. 9. Tune In – Just as a good musician can coax sweet tunes out of even the cheapest guitar, a fisherman who is experienced with electronics can find fish with an inexpensive fishfinder. On the other hand, a beginner needs all the help he can get. While I wouldn’t start out with top-of-the-line equipment, I’d certainly make sure you get a unit that is of high enough quality to show immediate results. A fishfinder is only as good as the person who is reading it. 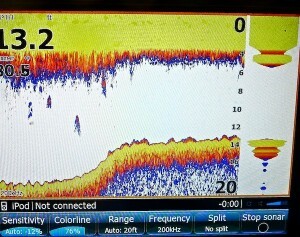 Tuning in to the returns you see on your sonar takes practice, but you can reduce the curve by watching and learning from an experienced fisherman or by studying various examples. 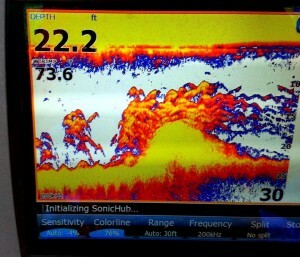 To the left, I’ve posted a fishfinder screen shot. Do you see striped bass? In this situation, the bottom is hard oysters, so it shows up yellow on the screen, but something isn’t quite right. See those red marks? That’s the fish. Sometimes stripers will hold motionless while lying side-by-side on the bottom. Other boats drove right on by. We had a very good afternoon. 10. Don’t Jump The Gun – I’ve studied the improvements in fishfinder technology for almost a half-century and I’ve found that truly innovative advances come in leaps and bounds. The next big advancement after the Little Green Box was the introduction of strip chart recorders, then came the LCD screen, then side scan. Is CHIRP technology the next big thing? It’s improving quickly, so I’m paying attention. The trick to pulling the trigger on a new fishfinder is to distinguish between the advances that are truly innovative and the ones that are merely incremental. If you’re buying new for the first time or you need something right away, then by all means look at the current market. But, if you already have electronics and you’re considering an upgrade, wait until something comes along that really makes a difference for the way you fish. Things can change quickly, so stay tuned! The striped bass are still piled in on the East side of the Bay on the hotspots between The False Channel and north up to Swan Point. Because they’re so concentrated, they’re getting hit pretty hard. Live lining is producing quick easy limits for almost anyone who tries. If you live line, do the fish a favor and use circle hooks so you don’t gut hook the fish you need to release. Eastern Bay is holding a few fish on the ledges but you have to look for them. Topwater is picking up with a few fish blowing up around rocky points in low-light situations. There has been fish breaking near Love Point, Kent Point, North and South Poplar, and near The Hook. The Bay Bridge is still strong but watch out for all the line wrapped around the pilings left by bait fishermen. Speckled trout fishing is still good south of Taylor’s Island and especially in the Tangier. I’m hearing of some nice red drum being caught occasionally near Crisfield. Most of my fishing has been in the evenings. I’m occasionally finding time to tweet my strategies and results in real time as I go along. If you’re interested, you can follow @shawnkimbro on Twitter. I’ll try to use the hashtag #CLT on my fishing trips. Here’s a shot of Jamie Clough with a nice summer striper caught on a hotrodded 6″ BKD on a half-ounce jig head near Swan Point. Good luck fishing! I wish I read this 6 months ago. Do you think using a low frequency transducer is why I can’t see the bottom when I am underway? Yes, a low frequency xducer will not hold the bottom as well as high frequency. If you have a ping speed adjustment, turn it up as high as it will go. It might help a little but your best bet is to swap out the xducer. Okay well I still don’t see the fish in that one picture. Do you mean the blueish red marks that are suspended between 6 and 10 feet deep? Bill, the bottom is all yellow but there are some occasional red humps on the bottom on the ledge and on to the right. That’s the fish. This is not a common situation but it happens from time to time. I am Jack Dalton. My brother-in-law, Harold Metler mentioned me to you and you were so very kind to send me an autographed copy of your book which I devoured. I was very pleased to learn that you are as avid about catch and release as I am. I feel we have a duty to the resource and to our progeny to protect and preserve. You are not only a great fisherman but also a very good writer. I hear that you work at The Geroge Washington University, I have a very good friend, Bernard Demczuk who also works there. He and I have spent some very good times fishing largemouth in the rivers of DelMarVa as well as on Lake Gaston, NC. One of my favorite things is top water fishing and I am excited to think I could catch a good size striper on top water. When I finished your book I loaned it to my brother-in-law in Lynchburg Virginia who also loves fishing. I told him that in you dedicating the book to me you invited me to come fish with you. Well, he was extremely jealous and said I should invite him. You mentioned that fall is a great time for top water and I was wondering in early October we could get a day together? As I said, Rob lives in VA but he has business in MD that needs to be done in early October so we can schedule something around whatever is going on in your world. Please let me know if such a thing is possible, we would both be forever grateful. I’m constantly researching ways to improve my light tackle fishing in the bay, and every search I make leads me to another informative article/post like the one above. Great job of breaking down such a complicated subject. To save myself time in the future, I’m just going to start googling “Shawn Kimbro” instead. I have been searching for a comprehensive reviews and this is one of those! 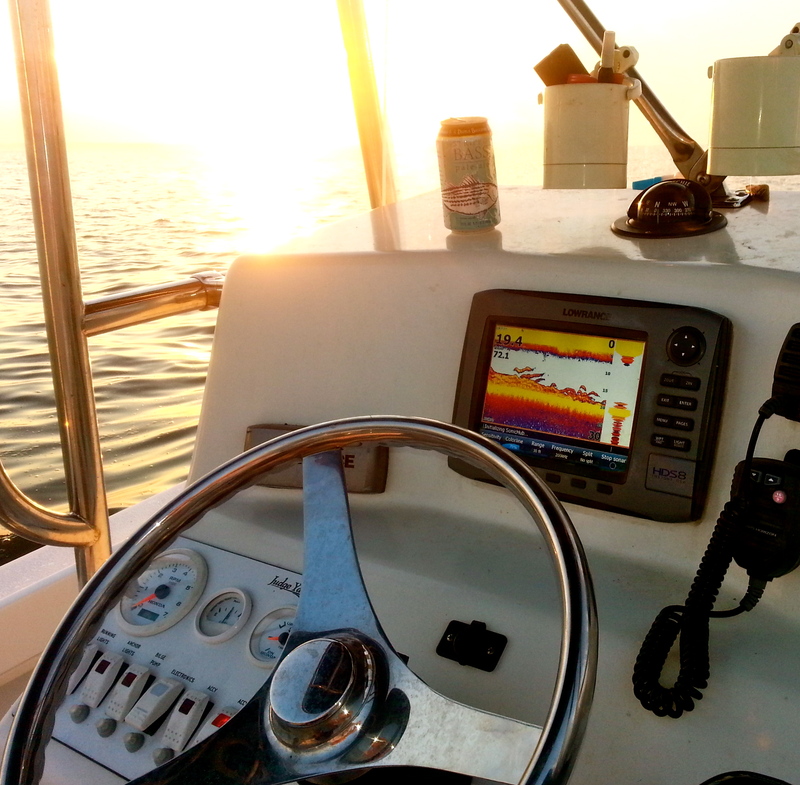 I have learned a lot and discover different Fish finder in the market. 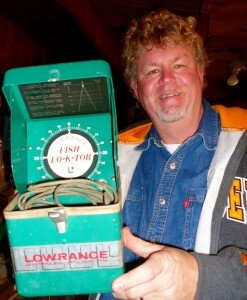 I have my own Fish finder which I am very satisfied with it. I bought the unit at http://www.gainexpress.com and used the code 10SPECIAL to avail 10% off. I love fishing! I also try to read about fishing news and report.I have learned many things about this fishing report. I have also fishing blog https:fishingmood.com. I think that You are not only a great fisherman but also a very good writer. great! if you want to explore the new model fish finders. I will ask you to visit https://www.fishfinderreviews.net my site.